THANKS, WALTER. YOU’RE WHY WE’RE HERE. Walter J. Bade loved to create and consume art. Whether painting or drawing, spinning records by Louis Armstrong and Miles Davis, or crafting a vodka martini in his workshop, Walter valued originality in all its forms. As an aspiring artist, he also longed to connect with other artists — a collective of likeminded creators who would share ideas, trade tools and techniques, and inspire each other. Unfortunately, life got in the way, and Walter never found the community that would help elevate his game and bring his art to the world. Thankfully, the dream doesn’t have to pass with the dreamer — and The Walter Collective is proud to write the rest of his story. We’re here to create the finest spirits by bringing distillers, cocktail artists and beverage enthusiasts together in an energetic, collaborative relationship. From brainstorming unique grain bills to creating the missing tool in the bartender’s toolbox, our goal is to do something common in an uncommon way. 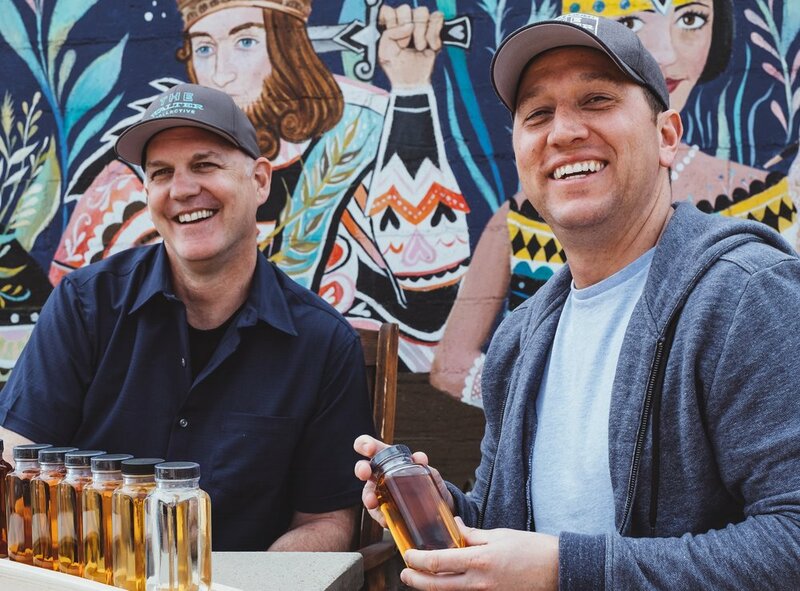 And we believe that by bringing diverse perspectives, talents and strengths to the table, there’s no limit to what we can contribute to the craft spirits community. Whether you’re part of the talented crew that helped distill our spirits, a bartender who believes in and uses our products, or a cocktail lover who’s shared their discovery with friends, thanks for being a part of our collective effort. Let’s keep doing great things together! What was life like in Walter Bade’s post-war America? Let’s travel back for a snapshot or two. Circa 1946 Our boys were coming home by the boatload. America had won the war, and all those soldiers, nurses and Rosie-the-riveters could get back to getting degrees, working jobs, buying homes and raising kids. Soon, American cities and towns boomed, the roadway system grew, factories were re-tooled and rebuilt, and TV entered its golden age. Economic prosperity and the entrepreneurial spirit were producing all kinds of new toys, foods, products and appliances. With the war behind them, American craftspeople and artists welcomed a sense of security absent for at least a decade. In the art world, abstract expressionism caught fire with Pollock, de Kooning and Rothko leading the movement. In the music world, Sinatra, Armstrong and Sarah Vaughan embodied the daring sounds of the ‘40s and ‘50s. Dapper men and polished women spent late nights at downtown clubs to revel in the music. Couples danced, celebrated. And more often than you might think, they went home together. Among the throngs in Chicago was our own Walter Bade — WWII veteran, snappy dresser and all-around hip cat. Circa 1953 Boom! Thwack! All around Chicago, the sounds of progress: Skyscrapers rising. Factories cranking out parts. Trucks making deliveries. On weekends, the city buzzed with Wrigley Field roars, throngs of beachgoers and kids cruising Lincoln Boulevard. In these glorious post-war years, our Walter Bade was busy raising a family. Workdays were spent at the Chicago Department of Water, and on weekends, he, Margaret and their kids would often stroll the Lincoln Park Zoo or visit one of Walter’s favorite haunts, the Art Institute of Chicago. Here, he took great pleasure in the Impressionist collection, the photorealism of Andrew Wyeth and Edward Hopper, and Norman Rockwell’s heartfelt storytelling. After downtown adventure, it was back home for supper. Then, while Margaret put the kids to bed, Walter would retreat to his workshop for a vodka martini and some jazz. With paint brushes in hand, he’d create scenes of whimsy and humor: A dog chasing a mailman. A car splashing a well-dressed businessman. A blonde beauty kissing a red-faced gent. This was Walter at his very best, a creative soul who knew that surviving these Eisenhower years — materially rewarding, yet constraining and rigid — required an artistic outlet. Of course, a stiff drink didn’t hurt, either. MEET MATT MELAIK, FOUNDER OF THE WALTER COLLECTIVE. Grandson of our namesake, Matt Melaik has always been a curious soul. Combine that inquisitive nature with his nuanced palate and love of spirits and The Walter Collective was all but inevitable. As he planned to pursue the “liquid arts,” inspired by Walter’s life and times, he knew that going it alone can limit creative potential and, frankly, be exhausting. So he set out to create exceptional spirits with a fertile collective of forward-thinking distillers, bartenders and creative partners who celebrate the art of craft distillation. And our award-winning Gin and Vodka are just the beginning.